Sound "Neutral, precise, and articulate," yet "transparent and resolving" too -- they "never ceased to impress [Doug] with their level of sonic refinement"; "pristine clarity and outstanding resolution throughout the entire frequency range," but somewhat laid-back, perhaps sounding "polite" to some listeners. Features Rear-firing woofer and wide-range midrange driver; "refined" looks; optional hard-sided shipping cases make moving the speakers easy and safe. Use Because of the rear-firing woofer, boundary reinforcement is crucial to the bass response; work best in medium-sided rooms, where high SPLs are not required. Value Offer a large taste of Verity's flagship Parsifal Encore speakers at a little over half their price. Im as guilty as the next person for sometimes falling prey to gee-whiz technology and impressive visual presentation. You know what I mean, the kind of stuff that grabs you and holds on, if only for a moment, because it appears to be too good to be true (and often is). Unfortunately, modern advertising and promotion seem to rely more and more on these things, with campaigns and slogans that serve little purpose other than to assault our senses just so products get noticed. As a result, understated products -- no matter how exquisitely designed, beautifully built and superb-sounding they are -- often get overlooked. Being a reviewer, though, forces me to look beyond all that. The main reason is that I live with a product for such an amount of time that I get to really assess whether it's special or not. The Verity Fidelio is a product that arrives without a lot of fanfare and hoopla, but it is indeed very special and deserves some serious attention. In fact, if allowed only one word to summarize this speakers sonic presentation, build quality, and outward appearance, I would choose refined. This, in a nutshell, is what the Fidelio is about, both visually and sonically. Look quickly at the Fidelio and you may be tempted to walk right by. Its relatively small, 10.3"W by 13.8"D by 37.5"H, and comes in a beautiful piano-black finish that allows it to disappear in a room. It looks, if only through a quick glance, like a nicely built, but rather simple loudspeaker -- but looks can be deceiving. 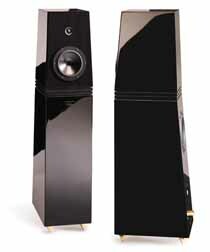 Cynics may even dismiss it as just the "little brother" to the companys $13,100-per-pair Parsifal Encore loudspeaker. Both are from designers Bruno Bouchard and Julian Pelchat (co-owners of the company as well). However, its not until you really look at the Fidelio -- I mean really look, and then preferably live with it for a time, like I did -- that you begin to appreciate the extraordinary attention to detail of this rather deceiving design. Construction is exceptional. A knuckle wrap on all sides reveals that the cabinet is quite inert. The bottom and top cabinets are separated by a unique locking mechanism that involves the use of two MDF plates. The bottom of these two plates is actually attached to the top cabinet, and the upper plate is attached to the bottom cabinet. According to Bruno Bouchard, there is a mechanism, sort of like a "U," that attaches one plate, and cabinet, to the other. The goal here is obviously to attach the two cabinets together, but in a way that reduces their interference with each other. Bruno says that this method is not quite as good as whats employed in the Parsifal, with its granite slab and all, but it is still "very good." The real hallmark of both Verity speaker designs is in the implementation of the midrange driver. The designers feel that the ear is extremely sensitive to midrange anomalies, so their goal is to keep all crossover components away from the midrange frequencies. To do so requires a very unique driver. The 5" midrange comes specially made from Audiotechnology of Denmark and it is the same one that is used in the Parisfal Encore. It is run very wide band, from 200Hz to 5.5kHz -- a much wider range than you will find with most loudspeakers. Whats more, at the upper limit there is no electrical network employed. The designers simply let the driver run free, and by using mechanical methods, they claim to achieve a third-order acoustical roll-off. The tweeter does use a third-order electrical network to achieve the integration between it and the midrange. On the low end, the speaker crosses over from the midrange to the woofer at 200Hz using a first-order electrical crossover on both the woofer and the midrange. Running the midrange unit over such a wide frequency band keeps electrical components out of the midrange area, but it brings up a few other issues that should be noted. First, the company had to find a driver that could operate well over that range because not all can. The Audiotechnology driver was chosen for its combination of being lightweight (to move very fast for the higher frequencies) and exceptionally rigid (to reproduce the lower frequencies). However, a problem surfaces when a driver is allowed to run at such a high frequency and then "naturally" roll off. As a designer, you have to be more concerned with breakup and distortion since the driver is, in fact, reaching its performance limits. Rolling it off early, through electrical means, helps eliminate these problems, but Verity is not doing that here. Verity claims that this was all factored into the design with special damping and modifications to make sure the cone behaves properly in the roll-off region. However, there is another problem in pushing the driver to such a high frequency. When a cone driver like the midrange used in the Fidelio runs into high frequencies, it begins to "beam" (i.e., it becomes more directional, so more energy is focused in front of the driver as opposed to being evenly spread around). As a result, off-axis response will be affected at certain frequencies. This is basically a compromise that had to be made to achieve such a free and open state for the midrange. Sensitivity is rated as 88dB/W/m, and nominal impedance is said to be 8 ohms. The designers tell me that the impedance never dips below 6 ohms, which, if true, makes the Fidelio an easy drive for most amplifiers. My 75Wpc single-ended Blue Circle BC2 amplifiers worked very well. Have you seen some loudspeakers that look good from far away, but are far from good when you get really close to them? The closer I get to the Fidelio, the more impressed I am -- even inches away. Overall build quality and styling are exceptional. The finish on all sides, including the bottom, is without flaw. The front of the upper portion is covered in a thin felt-like material with silver metal points near each corner. These points are actually strong little magnets that the grille attaches to -- niiiiiiice! The big metal floor spikes and excellent speaker-cable connectors are custom-made by Verity. The speaker may not be all that big, but like everything in this well-thought-out design, that too is deliberate. Veritys goal is to make reference-level speakers that can actually fit well into a modern décor. In terms of styling and build, there is simply nothing to criticize here. The Fidelio is understated, but gorgeous. A very worthwhile investment for loudspeakers of this caliber is the optional packing crates. Optional?!? Like almost all speakers, the Fidelios come well packed in cardboard containers as part of the standard price. However, for $750, Verity offers special, hard-sided carrying cases that have metal edges, a handle, and wheels (the case is standard with the Parsifal Encore). Four key-like latches secure it closed. Inside is foam perfectly cut to house each Fidelio. Transport ease and overall safety for the speaker are greatly improved with this case. The speakers were delivered to my house in these cases, and I can attest to the fact that they make moving and unpacking these speakers a whole lot easier. I say get em, especially if you plan on moving. Bruno and Julian both made the trip from the companys headquarters in Quebec City, Canada to deliver and set up the speakers. While you may not be able to get Bruno and Julian to your house, Ill let you in on a little secret they used that worked astonishingly well in setting up the speakers in mine -- keep reading. However, before we took the easy road, we tried the good ol trial-and-error method with our hands and ears and achieved some fine results. Associated equipment used in this setup included the Blue Circle BC2 monoblock amplifiers and BC3000 preamplifier, Nirvana Audio SL interconnects and speaker wire, and both my own Theta Data Basic/Prime II DAC combo as well as the outstanding Audio Aero Capitole CD player as source. We first tried putting the speakers where I thought they should go (where I place the majority of loudspeakers in my room), and they sounded quite good. Bruno and Julian then made some adjustments by placing the speakers even farther apart and adjusted the toe-in. This change improved soundstaging in terms of width and height. We listened for a time and were quite pleased with the results. However, the designers obviously knew that the speakers were capable of more because they still werent satisfied. It was then that Bruno pulled out his laptop and fired up RPGs RoomOptimizer software (it runs on Windows platforms). The software allows for input of precise parameters in terms of room width, depth and height, and surprisingly, it allows for individual input of each drivers exact placement on the cabinet. (One limitation is that it appears to only work for rectangular rooms.) A few minutes later, the calculations were complete, and the best option that the computer could come up with was given. Surprisingly, it was a good foot back and even wider apart than Bruno and Julian had set the speakers. We placed the Fidelios there and reveled in the expansive stage and "even-sounding bass." The computer program obviously knows something about room responses. However, for what we gained, we lost a little bit of impact and vibrancy. So Julian moved the speakers ahead just two inches and, presto, perfection was within our grasp. "Neutral, precise, and articulate" were the first words I jotted down. After a while I added "transparent and resolving." Many days (and CDs) later, I added the words, with the following punctuation, "extraordinarily so!!!" And after that, I underlined it. No matter what type of music I threw at the Fidelios, they never ceased to impress me with their level of sonic refinement. Just like their understated but elegant appearance, the speakers don't call attention to themselves sonically, leaving an expanse of musical information that is jaw-dropping at times. They are never harsh, spitty or emphasized in any unnatural way. I suspect that some people who mistake resonance and midrange coloration for musical texture and detail will find the Fidelios a tad too laid-back, but what they would be hearing is the overall skill of the speakers. There is pristine clarity and outstanding resolution throughout the entire frequency range. The soundtrack to The Million Dollar Hotel [Island 314 542 395-2] features U2, Daniel Lanois, Brian Eno, and a host of other musicians. The sound is purely artificial in terms of its soundstaging -- multitrack, heavily mixed, and with lots of unnatural reverb -- yet, like many other albums with which Lanois and Eno have been involved in the production, there is a huge sense of spaciousness and loads of detail. While this heavy mix can sound a tad slow and muddled through some speakers (those lacking detail and precision), the quick and nimble Fidelios cast a precise and exquisitely detailed stage with wonderful width and depth. Even out of the center sweet spot, I sat amazed at the amount of musical information the Fidelios presented. They are not just about staging, though; the closely miked vocals and instrumentation were as tight, precise, and detailed as the imaging. Even on male vocals, no bloat or chestiness, which can obscure detail and add unnecessary coloration, could be detected. Its a slightly different presentation to the more lively and vivid-sounding JMlab Mini Utopia that I just reviewed. Some would call the Fidelios more "polite"; they and the Mini Utopias will probably be preferred by different types of listeners. I next moved to Daniel Lanoiss own For the Beauty of Wynona [Warner Bros. CDW 45030]. Essentially, its a blend of studio tracks recorded at various locations and heavily mixed into the resulting songs (the interesting liner notes explain all this). Overall sound quality is good, but in spots its a tad mechanical, even steely at times. It does have, however, Lanoiss trademark "euphoric" sound with a fantastic sense of space and depth through most of the tracks. Here, too, I was amazed at how precisely the Fidelios cast the stage and how easily discernible each musician was inside it. This was the first time I felt I was really hearing into the whole recording. For better or worse, the Fidelios are capable of astonishing transparency and detail. Im sure that if Lanois could have heard this recording over these speakers, he would have softened its sound a tad. No matter -- it still sounded the best Ive ever heard it. The guitars are rendered with a razor-sharp quality but without any unnatural resonance or looseness. Drums are tight and visceral. Every musical nuance, sound, and flaw of the recording is rendered with pristine clarity. I recently purchased Paul Simons Shining Like A National Guitar [Warner Bros. WTVD 47721], a newly remastered, greatest-hits package. Much the same thing was heard with this as with the other discs. Voice is exceptionally detailed, no hint of any chesty or woolly character that plagues some speakers in the midrange, and all instruments, from the sheen of a cymbal to the deep thump of a bass drum, are rendered with tremendous articulation. The Fidelios sound so fast, tight, and precise -- from the bass to high frequencies -- that its no wonder some recording companies and musicians use these speakers. One limitation did come up, though, as I was over-enjoying these songs. I learned that the Fidelio cannot play as loudly as some speakers. Cranking the volume results in compression of macrodynamics. The speakers only get so loud, something Ill touch on again later. Ennio Morricones soundtrack to the film The Mission [Virgin CDV 2402] gives a hint of the resolution the Fidelios are capable of. I say "hint" because the real limitation is in the recording (Id love to hear a remastered, audiophile pressing of this music). Nevertheless, the Fidelios reveal every nuance that the source in my system could conjure up. On the choral passages, each voice was beautifully delineated, and I was easily able to focus in on each singer. Furthermore, the clarity through the midrange and high frequencies is simply a revelation. The tweeter soars with infinite extension that gives a precise and airy sound. Its never bright, edgy, grainy or any of that (unless its in the recording, of course). Piano, one of the toughest instruments for a speaker to reproduce, is demonstrated with Naida Coles CD featuring the music of Fauré, Chabrier, Satie, and Ravel [Deutsche Grammophon 769748021-2]. It is tight, tuneful and exceedingly clear without any overhang or sloppy sound that plagues some speakers. Along with the exceptionally transparent midrange and infinitely extended highs, bass through the Fidelios is deep, tight and articulate regardless where the speakers were placed in the room. However, care must be taken in the setup to get the best-quality bass performance. According to Verity, the Fidelio's rear-firing 7" driver is capable of in-room response to below 40Hz, which should be plenty deep for most listeners. By making it rear-firing, though, the designers are relying on the room itself to help flesh out the Fidelio's bottom end and give a rock-solid foundation to the music. When the speakers are set up correctly, I can attest to the fact that music that really plumbs the depths is presented with excellent weight and detail. Playing the haunting melody from Jon Brions score for the movie Magnolia [Reprise CDW 47696], you can feel the full weight of the orchestra. However, all of this said, it must be noted that the bass presentation of the Fidelios is still not quite like that of some speakers that come to mind. Merlins VSM-SE (particularly with the BAM), Cliffhangers CHS-2/W-2 and also their Bulldog, as well as speakers like those in B&Ws Nautilus and JMlabs Utopia series have more visceral bass. Those speakers seem to play somewhat louder too. If you want something that can thump your chest with a direct rush of air, then the Fidelio isnt necessarily the best bet. But is this really a limitation? That depends. For those who like their music LOUD, or like to re-create lifelike musical events (a full orchestra surpassing 100dB in your living room, for example), or need to fill a very large room, the Fidelio might not be the best companion. They are ideally suited for medium-sized rooms, those not too small for floorstanding speakers but not overly large either. In my own 13' x 15' room, I was able to play the Fidelios plenty loudly for my own tastes. I wouldnt belabor this point, but I do want to point this out given the price point of the speakers and the possible assumption that they can do everything. Like all other speakers, the Fidelios have their limitations. An interesting comparison is with the Mini Utopias -- which don't go nearly as deep, but can hit the bass home with wallop and impact that the Fidelios cant quite muster. Both speakers are excellent, but each simply has its tradeoffs. Finally, As keen-eared audiophiles know, how loudly a speaker plays isnt indicative of its quality. Sometimes how quietly it will play tells as much. The Fidelios still sound wonderful at the lowest volume level my preamp can be set. This is a testament to the Fidelios' fine balance, neutrality and resolution. As a result, the Fidelios were played throughout almost every day they were in my house -- for background music and main listening. They are speakers I truly lived with. Veritys designers tell me that the Parsifal Encore speakers, at some $6000 more than the Fidelios, improve on the less expensive speakers in terms of bass response and soundstaging ability, and offer a smidgen more in terms of room-filling ability and ability to play loudly. If thats true, it speaks very highly for the value thats inherent in the Fidelio. I listened to this speaker for months and never felt I was missing a thing. Despite a few nit-picks, Veritys Fidelio is simply an extraordinary loudspeaker. Its not necessarily the best loudspeaker for those who require playback at far-above-normal listening levels, have a very large room, or have a preference for a more up-front, visceral and gutsy presentation -- something like the JMlab Mini Utopia or Cliffhanger Bulldog is better for that. As well, the Fidelio is not a flashy speaker either, in terms of its appearance or sound. And its certainly not cheap. But its exceptionally refined. For those who value a complete sonic presentation -- precision, neutrality, musicality, and simply awesome transparency and resolution -- this speaker will stand tall among its peers. While these all may sound like audiophile superlatives, fear not -- the Fidelio is an audiophile speaker that truly serves the music. Along with its high level of sonic refinement, it is also elegantly styled and superbly constructed and will undoubtedly complement the finest décor. If it sounds like Im gushing over this speaker, I am. The Fidelio is really something special. Price: $7150 USD per pair.